SCW Fitness Education strives to change lives for the better, and one way we do that is by choosing a charity to support at each MANIA®. We will never forget that Dallas MANIA® took place the weekend Hurricane Harvey hit Texas, so to aid those affected by Hurricanes Harvey and Irma, we are choosing the charity #FitnessCares, created by SCW Presenter Jeff Howard. Please join us at Midwest MANIA® on Friday, Sept. 22 from 5:30pm-6:30pm in the Expo area for a not-so-Silent Auction in which proceeds will benefit the victims of these natural disasters. Can’t wait to donate? Visit www.ghcf.org (for Houston) and www.volunteerflorida.org/donatefdf/ (for Florida) to make a difference today. We can’t wait to see you at Midwest MANIA®. Thank you for helping us make the fitness-professional community one of the most giving – in body, heart and spirit. For more information on Midwest MANIA®, please go to www.scwfit.com/MIDWEST. Fitness folks love a challenge, so here’s one for you. Start to look at each new month like you look at the New Year. Reflect on what you accomplished the month prior and set new goals for the month that lies ahead. Now take it one step further. What changes can you implement this month to make bigger strides toward your goals. All fitness enthusiasts know the importance of changing up the workout routine to avoid physical plateaus. So how can you change the way you physically train this month to get closer to your best? Get creative and start to see your go-to training partner in a whole new light. If you traditionally use medicine balls for core or cardio, brainstorm on how you might use a medicine ball for strength or max power. Or challenge yourself to hit every body part with the same piece of equipment, such as a kettlebell or a resistance band. String together movement combinations or supersets that are challenging. When programming for ourselves, we tend to choose moves that we like to perform. Push yourself further by implementing more exercises that will challenge you mentally and physically. This can be a challenge in itself for the #fitfam who knows their way around a gym. However, look around and see if there is a piece of equipment that you have never or rarely use. Work with this piece in the way it was intended and then try to think of one safe alternative way to use it. Begin the month with a fitness test or physical challenge that will serve as the benchmark, and then retest at the end of the month. Add purposeful and focused coaching cues to each set. This will help to reset the mind and focus of your client or group before they begin the movement. If working with a group, walk around and give personal focus cues to improve performance or instill motivation. If you can do just one thing this month to change the way you train, you can inspire others to do the same. A new month is a clean slate to hit the reset button and charge after something new in the pursuit of better. You can accomplish more when you move forward with positive, focused energy toward a new goal or challenge. What can you do in the next 30 days to get closer to the best version of yourself? Let’s face it – new equipment can definitely bring a breath of fresh air into your facility or programs. Perhaps you have recently gone to a fitness trade show and been so impressed by the latest “toys” on the market that you want to bring them ALL back to your club. Wanting them all, but trying to decide which ones will be cost effective AND keep the members happy can be a daunting task. What do you look for? Something that is brand new to your facility or something you can seamlessly integrate with your existing equipment? While it is easy to fall for the shiny and new, what will be the BEST choice for the participants in your programs? One of the latest trends to hit the market is Hydro-Inertia® training with water filled products such as the Kamagon® Ball and the Surge®. Trainers and instructors use these products to enhance strength and endurance as well as the balance, stability and reactivity components of fitness. They are also extremely useful in improving proprioception and kinesthetic awareness. One of my favorite features of these products is the ease of varying the challenge of the exercise, just by changing the amount of water inside. You don’t need an entire line of different weights (i.e., dumbbells) taking up space; just vary the amount of water to increase or decrease the challenge! If you are a personal trainer that travels from client to client, house to house, take into account how easy it is to transport this type of equipment – just add water! Another benefit to incorporating the Kamagon® Ball and Surge® into your programs is the stealthy way that Hydro-Inertia® enhances a workout by engaging the core. Everyone wants to work the core! Due to the dynamic properties of water, the entire body has to respond to the water actions. The core is activated as you REACT to the demands of the ever-­‐changing environment that is being created. Think of it like “controlled chaos” – the workout can actually feel different every time, even when the exercises are the same. Because of the great variety of exercises, these products seamlessly integrate into small group training, circuits or HITT classes. The trick of turning “toys into tools” is education. Attend a workshop or conference session that teaches you how to properly use the equipment. It is essential to learn not only how to use the product with good form, but how to care for the product as well. Get solid information on how to integrate these to tools into existing classes without overwhelming the members. All the new tech and gadgets aren’t worth anything if we don’t create an environment of success for our clients and class participants. One of the first things I like to do with a new piece of equipment is a familiar exercise or drill get a feel for the new equipment with a movement pattern that is already comfortable. You don’t have to create a three-­‐ring circus every class, every time. As instructors and trainers, I am willing to bet that WE get bored way before participants do! Keep it simple. Introduce new things in stages. Let participants feel successful and keep it fun! How did you get your start in the fitness industry? Fitness was obviously always an important part of my competitive dance career, where success depended on developing muscle endurance for 10-hour competitions, strength for lifting partners and core strength for posture, balance, everything. It was after Season 9 with Kelly Osbourne – watching her transformation and listening to an American Heart Association ad that identified obesity as the No. 1 health crisis in America – that I began to see the merit of a dance-based fitness program, which brought the dances of DWTS to everyone (even people with 2 left feet) and was partner-free. I believe if everyone finds the joy of dance and moves more that it would make a dent in reducing the large number of obese people. Worst / most embarrassing moment? I have ADD, and as a consequence, I am always doing at least 3 things at once. I’m fast and I get a lot done, but I have a tendency to forget to zip up my pants! To forget that on national TV in front of millions is quite embarrassing. Especially while wearing fluorescent underwear!!! After years of teaching/coaching champion dancers for the highest level of competition, I wasn’t sure how the transition into the fitness world would go, especially teaching ‘regular’ people. It was the best decision I ever made. You couldn’t put a dollar amount on the feeling when I see people’s lives change through dance and LaBlast®. It’s so humbling to hear the testimonials of people from different walks of life. I didn’t realize how uplifting and therapeutic dance can be for everyone and anyone until I created the LaBlast® dance fitness program. Because LaBlast® Dance Fitness is a workout in disguise, I truly believe it can decrease the incidence of obesity and help bring back romance to married couples, improve relationships, build confidence, and above all, make working out for everyone addictively fun! So, that’s my goal and plan: Fighting Obesity through dance! Best tip for other wishing to make a living in the Fitness industry. Knowledge is power. Invest in your body and mind. Do as many certifications in programs that you are passionate about, and make sure you have a good sense of business and an outgoing personality. Keep learning, and don’t get complacent. People like to be entertained and love a good leader. Be intuitive, follow your gut, and don’t forget, we all like to be little kids once in a while no matter our ages, lol. In other words, don’t take yourself too seriously all the time. Remember to have fun! Even though we are in the fitness world and we want people to get fit and be healthy, we want to make sure people have a great time and are entertained. The more fun people have, the more they want to come back and workout. All the health benefits will come, not from pushing, but from you entertaining them. A quality class is not the enemy of entertainment! COME TO A MANIA® NEAR YOU AND TRY LABLAST® FOR YOURSELF LIVE! POUND® is a place where the rhythm rules. Where the beat becomes us. At every age and any stage. Movement Musicians are born. We are a family of Fitness Rebels born to stand out, make noise and disrupt norms. We turn workouts into Jam Sessions and balance into a lifestyle. We’re not afraid to turn up the volume in class, as humans, or in life. As a community, we believe we have the ability to inspire a nation, to turn the fitness world on its head, and to truly find alternative ways to ROCK. We POUND with PASSION and we AIM for Progress. We aspire to change minds before bodies and use beat to launch people to new heights of self-worth, happiness and human connection. Led by co-creator and CEO, Kirsten Potenza, POUND® currently is taught by over 10,000 instructors in 40+ countries to hundreds of thousands of participants a week, making an active, supportive and passionate community. Instead of listening to music, you become the music in this exhilarating full-body workout that combines cardio, conditioning and strength training with yoga and Pilates-inspired movements. Designed for all fitness levels, POUND® provides the perfect atmosphere for letting loose, getting energized, toning up and rockin’ out! The workout is easily modifiable, and the alternative vibe and welcoming philosophy appeal to men and women of all ages and abilities. Burn up to 900 calories per hour, strengthen and sculpt infrequently used muscles, and drum your way to a leaner, slimmer physique – all while rocking out to your favorite music! Drastically improve your rhythm, timing, coordination, speed, agility, endurance and musicality. Numerous studies have proven the powerful brain-boosting, stress-relieving effects of drumming. The rhythm of drumming permeates the entire brain to improve focus, increase higher-level thinking and decision-making skills, boost the immune system, lower blood pressure and decrease chronic pain, anxiety and fatigue. Instead of counting reps or keeping track of the clock, POUND® strategically distracts you from the high intensity and duration of your workout and shifts your focus to rhythm and volume. This strategic distraction is responsible for the “addictiveness” of POUND®. It’s the reason you can’t stay away! Each 2- to 4-minute song is carefully calibrated with interval peaks and extended fat-burning sequences, providing you with the best workout in the shortest span of time. After you’re done rocking out in a 45-minute POUND® class, you’ll have completed up to 15,000 reps, performed over 30 extended interval peaks and zipped through more than 70 techniques – without even realizing it. 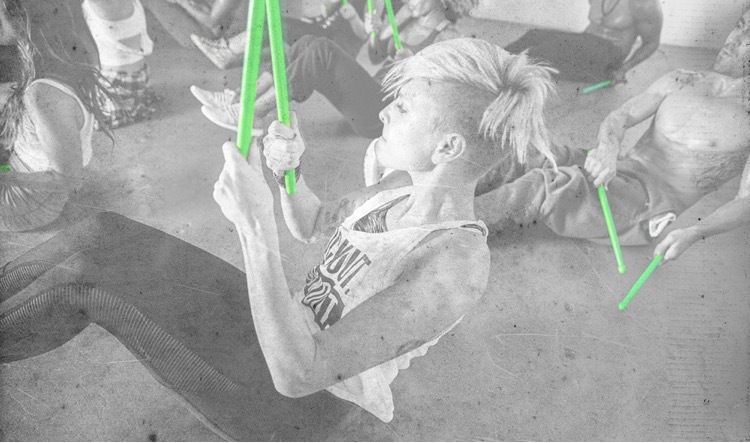 We’ve invented unique, lightly weighted exercise drumsticks called Ripstix®. Ripstix® add 1/4 lb. of extra weight to each movement, which throws the body off-balance, creating contraction in the core and stabilization system. Ripstix® intensify each POUND® position with light, peripheral resistance that not only works the shoulders, biceps, triceps, forearms and back but also dramatically increases the amount of instability in the body. They’re made of durable plastic and are easily transportable — and can go through airport security — so you can take your Ripstix® anywhere!